My son was a patient of Dr. Grant. He was two weeks away from an appointment, and was taken to the hospital and kept on suicide watch. I called Dr. Grant to get him in, but was told they had no openings. I was to call to see if they had a cancellation. I tried several times, but was only able to get him in when his appointment came around. Then they only saw him for 5 minutes. So in two weeks, they couldn’t get a suicidal patient in for 5 minutes? And I have had nothing but problems with prescriptions written. Every one requires prior authorization, so my son runs out of medication before the doctor and the insurance get it straightened out. Why doesn’t the doctor approve it when he decides to write the prescription? I do not recommend Dr. Grant or his office to anyone for any reason. Given the enormous potential for great harm, one has to wonder how the Food and Drug Administration, FDA, gets away with giving its stamp of approval on a new “brain wave test,” that allegedly will “help confirm an ADHD diagnosis,” when there is no scientific or medical proof that any physical abnormality exists. 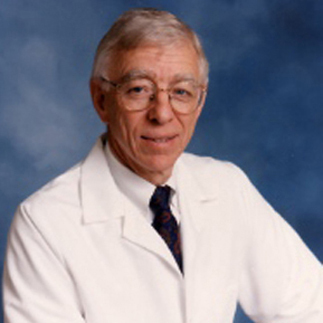 What part of approving a “brain wave test” for a psychiatric diagnosis that doesn’t exist is “assuring the safety and effectiveness?” More to the point, since there is no proof that the alleged psychiatric diagnosis exists, how can the FDA possibly claim that any test, least of all one that consists of interpreting squiggly lines on a piece of paper, is safe or effective? Is this a case of group-think? 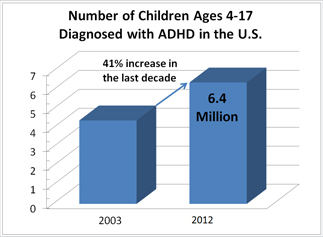 The FDA heard, has been told, believes ADHD exists? And the APA, itself, writes, “There are no laboratory tests, neurological assessments, or attentional assessments that have been established as diagnostic in the clinical assessment of Attention-Deficit/Hyperactivity Disorder.” Okay, seems pretty clear. The ADHD diagnosis is completely subjective and not based in science. The FDA ignored these facts and, in what appears to be an irresponsible attempt to validate ADHD as a science-based psychiatric diagnosis, has opened the floodgates for creating more victims and the already epidemic numbers of children being diagnosed with the alleged ADHD will skyrocket. According to the Centers for Disease Control and Prevention, CDC, there has been a 41 percent increase in the diagnosis of ADHD over the past decade and one in five high school boys (11 percent of all school-age children) have received the non-scientific diagnosis. More troubling is that based on a 100 percent subjective ADHD diagnosis, nearly 3 million American children are currently taking prescription mind-altering drugs as “treatment” that are the equivalent of cocaine, carrying serious adverse reactions. And aside from the fact that there is zero proof that ADHD is an abnormality of the brain, the FDA’s approval of the new EEG device called, “Neuropsychiatric EEG-Based Assessment Aid,” the NEBA System, is suspect on a number of levels, including its blatant lack of information about the data used to decide on approval. For example, the makers of the EEG device, NEBA Health of Augusta, GA, have not publicly released the clinical trial data with which the FDA based its approval. Moreover, the FDA failed to name the “independent ADHD” experts who tested the NEBA System, which is absolutely necessary for disclosure purposes, revealing whether there are financial ties between the company, ADHD drug manufacturers and even the members of the FDA’s approval committee. Additionally, because the FDA did not make available the clinical trial data, there is no way to know the number of participants who may have been taking mind-altering drugs, like Ritalin or Adderall, for “treatment” of the non-existent ADHD, which certainly would have an effect on the outcome. For many doctors (neurologists) who actually study the brain, the FDA’s NEBA approval has nothing to do with science and could be considered borderline criminal, as there is no proof of any ADHD brain abnormality for the EEG to assist in diagnosing. In other words, since there is no physical abnormality called ADHD, what exactly is the EEG “assisting” in diagnosing? 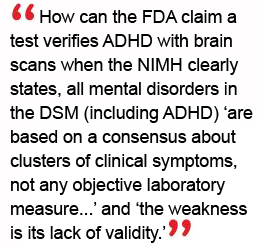 No brain abnormality, no disease and the APA’s diagnosing manual “lacks validity.” What part of these facts didn’t the FDA understand when it decided to approve a “brain wave test” for “assisting” in the diagnosing of a non-existent psychiatric disorder? Kelly Patricia O’Meara is an award winning former investigative reporter for the Washington Times, Insight Magazine, penning dozens of articles exposing the fraud of psychiatric diagnosis and the dangers of the psychiatric drugs – including her ground-breaking 1999 cover story, Guns & Doses, exposing the link between psychiatric drugs and acts of senseless violence. She is also the author of the highly acclaimed book, Psyched Out: How Psychiatry Sells Mental Illness and Pushes Pills that Kill. Prior to working as an investigative journalist, O’Meara spent sixteen years on Capitol Hill as a congressional staffer to four Members of Congress. She holds a B.S. in Political Science from the University of Maryland. In my Opinion The big proof that Cathal Grant is not a doctor, but a fraud prescribing drugs that do not even try to cure his patients, and prescribing drugs that have been proven to be no more effective than a Placebo or Sugar pill, the evidence is all here from Videos broadcasted by CBS’s 60 minutes and other sources. In my opinion: Mass Murders And The SSRIs Connection, yet Cathal Grant keeps prescribing SSRI, and getting people hooked on these dangerous drugs which have been found to be no better than a sugar pill Cathal Grant’s patients has attacked family members, and Cathal Grant shows no sign of caring for anything, but the money for his office visits. In my opinon finally the truth about ADHD: Before His Death, Father of ADHD Diagnosis Admitted it Was a Fictitious Disease, in our experience Cathal Grant knows this also, but he keeps prescribing the drugs becasue his is paid to by the drug companies, in spite of the facts these drugs do great harm to you.